After two near perfect days of racing on Bermuda’s Great Sound, Team Magenta 32, skippered by Sally Barkow, clinched victory at the third and penultimate stage of the M32 Series Bermuda posting an impressive eight wins out of fifteen races over the two day regatta. "We had some great starts, good speed and not too many mistakes," commented Barkow on a perfect weekend for the team. 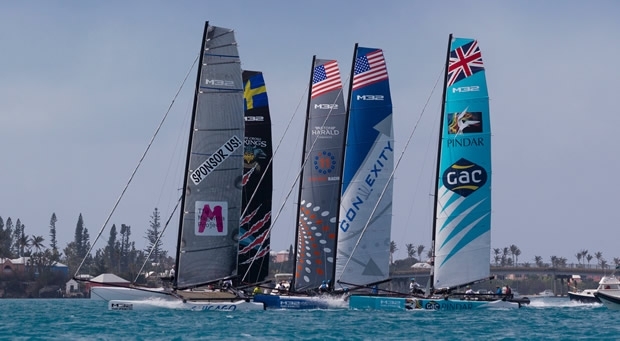 Finishing overall just one point behind Team Magenta 32 was Team GAC Pindar, skippered by six-time world match racing champion Ian Williams from Great Britain. Don Wilson’s Team Convexity, winner of the previous series event, finished third overall. All the M32 sailors competing in this weekend’s event could appreciate Mark Twain’s famous comment, “You can go to heaven if you want, I’d rather stay here in Bermuda.” With a total of 15 races over two days in a steady 8-15 knots, Bermuda again delivered its spectacular crystal blue waters with America’s Cup boats flanking the racecourse during their training. Coming off an impressive victory at the World Match Racing Tour in Fremantle, all bets were on Ian Williams’ Team GAC Pindar to take the lead in this third event of the four event Bermuda Series. However, Sally Barkow and Team Magenta 32 had other plans. Series leader Don Wilson and his Convexity team also looked to unseat Williams, while Deneen Demourkas’ Groovederci, Charlie Enright’s 11th Hour Racing 55 South Team and M32 Founder Håkan Svensson’s Cape Crow Vikings were all pushing hard for a podium finish. With an aggressive schedule, M32 Race Director Mattias Dahlstrom took advantage of the steady 8-15 kt northeasterly wind on day one, managing to complete seven short races. GAC Pindar strolled to victory in race 1 and looked as if they would cruise to a regatta win, however the Magenta 32 team soon turned on the after-burners, winning the next three races and proving to Williams that they were not going down without a fight. Magenta 32 stood atop the standings at the end of day one with an 2, 1, 1, 1, 2, 1, 3 scoreline. Showing a rapid improvement since the first event of the series in January, Håkan Svensson’s Cape Crow Vikings led several races and competed hard to sit in fourth position overnight on Saturday. Volvo Ocean Race skipper Charlie Enright’s 11th Hour Racing team had the misfortune of two team members having to visit the hospital due to illness and injury (non-serious), and US sailor Deneen Demourkas at the helm of Groovederci showed moments of brilliance, unfortunately hindered by some minor equipment issues on their boat. At the conclusion of racing on day 1, the fleet competed in a non-scoring “coastal race” around the Great Sound with a group of Bermudian Junior Sailors being given the chance the sail on board with each of the teams. Race day 2 greeted the fleet with a southwest wind of 9-13 knots and an on-time start. In the first race, the Convexity crew pushed hard with a last second gybe at the bottom gates causing the boat to capsize, ultimately costing them any chance of comeback. Magenta 32 and GAC Pindar swapped blows for the first four races of the day and were tied on points with four races remaining. Despite the use of some match racing tactics in the pre-start, Magenta 32 didn’t flinch once and banged off three glamour starts to string together three bullets. GAC Pindar pushed a little too hard and were over the line in two of the last four starts, ultimately sealing their fate and handing the win to Magenta 32. Recovering safely and quickly from their capsize, Convexity maintains the series lead over Magenta 32 by one slim point heading into the final event of the series over 15-17 April.